1. Preheat the Oven 375F. Grind the almonds to a powder. 2. Place in a heavy pot with 2 cups of the milk and simmer until thickened. 4. Heat the 1/4 cup of milk to lukewarm and infuse the saffron threads. 5. Add the Yeast and dissolve it completely. 6. Stir it then into the Almond milk mixture; set aside. 7. Mix the butter and 1 cup of flour and toss it well. Add the almond mixture,sugar and salt and mix it well. 9. Transfer the dough to a clean bowl,cover it with plastic and proof it for 1 1/2 to 2 hours. 10. Lightly grease a loaf pan, place the dough in it. 11. Brush it with melted butter ( optional ) and bake it for 25 min or until the loaves are golden brown and sound hallow when tapped on the bottom. 12. Cool it for 20-30 min before slicing. It turns out crunchy on the outside and moist in the inside. I luv it when its little warm though! Hi DK.. Just a small query.. Can I replace yeast with baking powder(I do not have yeast in my stock).. If so, when i should I add it??? Looking forward to your reply.. This bread is good. Try adding some carraway seeds. In winter toasting a slice gives it a light non invasive accent. Hi DK, Just browsed around and found this recipe... is it ok if I use carton almond milk directly? Thanks for your reply! I love the bread but how many degrees am i supposed to put on the oven. Please reply back and thanks A LOT if you do. :lol: Chow! What a lovely combination -- almonds and saffron. I must try this! Thanks for the detailed steps. Beautiful bread, even beautiful presentation. 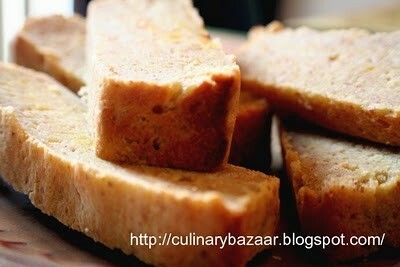 perfect loaf of bread dhivya... and saffron and almonds surely adds rich touch to it. very lovely looking bread and a great entry! Beautiful.Have not tasted Almond milk bread yet...but pics tell me its delicious. the bread looks fluffy n lovely dhivya..:) awesome entry. What a great bread and healthy too!Great entry!